Saturday July 26th 1890 I got to my sewing early. Aunt Lif and Emma Spence with her little boy were here for dinner Mother went to the depot with Emma in the afternoon as she started for home. She went out to Otts for supper and they brought her home Will was to the valley for corn in the forenoon and to town in afternoon and evening. I have worked all week on Mothers sewing but did not get it done. Sunday July 27th 1890 I was busy about the work most of the morning The weather was warmer today. The Woolf girls and Anna Shirts were here in the afternoon and Anna was sick so she staid all night. Ott & Fanny were here for supper. 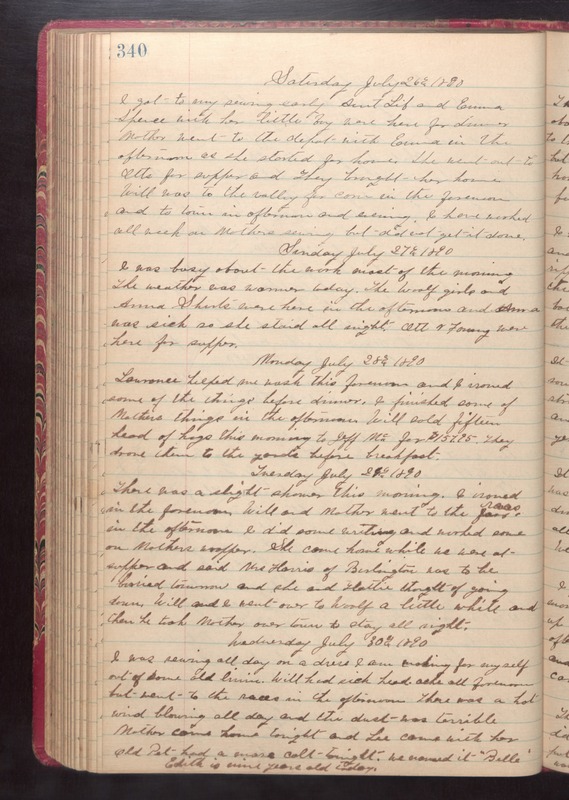 Monday July 28th 1890 Lawrence helped me wash this forenoon and I ironed some of the things before dinner. I finished some of Mothers things in the afternoon. Will sold fifteen head of hogs this morning to Jeff Mc for $157.95. They drove them to the yards before breakfast. Tuesday July 29th 1890 There was a slight shower this morning. I ironed in the forenoon. Will and Mother went to the races in the afternoon. I did some writing and worked some on Mothers wrapper. She came home while we were at supper and said Mrs Harris of Burlington was to be buried tomorrow and she and Hattie thought of going down. Will and I went over to Woolf a little while and then he took Mother over town to stay all night. Wednesday July 30th 1890 I was sewing all day on a dress I am working for myself out of some old linen. Will had sick headache all forenoon but went to the races in the afternoon. There was a hot wind blowing all day and the dust was terrible. Mother came home tonight and Lee came with her. Old Pat had a mare colt tonight. we named it "Belle". Edith is nine years old today.